Stunning Stucco Home On Huge, Lush, Cul-De-Sac Lot~Wood Floors Thru Entry, Kitchen & Nook~Formal DR Has French Doors Onto Gracious Covered Front Porch~Large Open Island Kitchen~Nook Walks Out To Huge Composite View Deck~Great Rm W/Gas-Log FP~Expansive Vaulted Master Retreat & 5pc Spa Bath & Sitting Rm Featuring FP & Walkout To Expanded Covered Balcony~2 Extra BRs, Laundry & Full Bath Up~Fin Garden Lvl Bsmt has FR w/FP, BR & Full Bath~Mtn And Peak Views~3 Fireplaces~Lush, Mature Landscape. 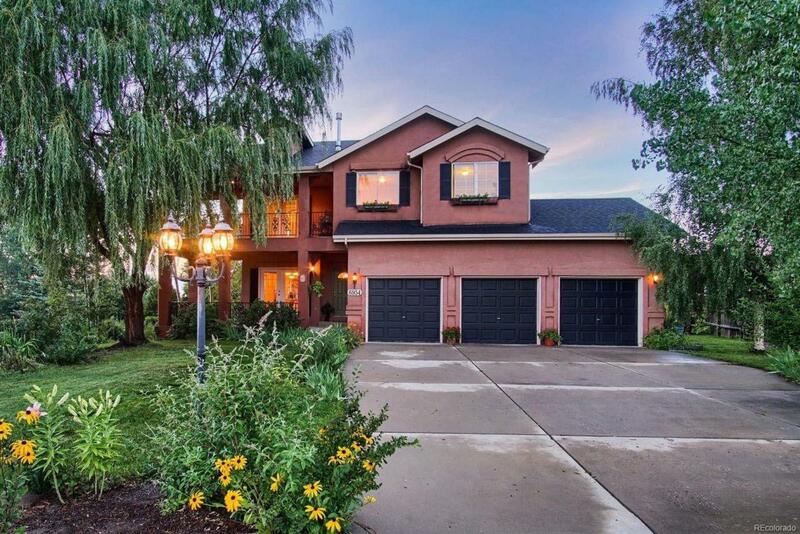 Conveniently Close To Everything!Impressive home on huge lot w/Mtn views. Upgrades incl central vac, sec sys, new water heater, decorative iron railings & fabulous outdoor living areas. Fireplace on each level. Wood floor Entry w/art niche. Formal DR has French doors out to lg covered front porch.